Funeral by William Henry Bartlett, 1887. As part of the 1916 centenary commemorations, the National Gallery of Ireland has put together 50 paintings exploring Irish history from the arrival of St Patrick to the twentieth century through the medium of art. There is also a book of the same title to accompany it. At the outset it must be said that not all the paintings are of the same quality and some are present only on the strength of their historical connections. Although many centuries of history are addressed here, some periods are better covered than others; the exhibition is not a chronological journey through time but instead is divided into five themes, so that in the one gallery there may be paintings from different centuries. This does make for interesting viewing, prompting us to think about their meaning and significance in this context. The opening gallery is dedicated to ‘Testimony’ and is dominated by the large painting by John Lavery of the trial of Roger Casement. 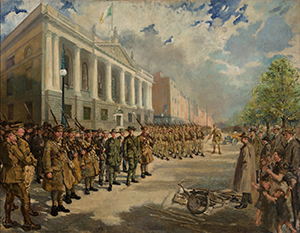 Other paintings depict the arrest of rebels on St Stephen’s Green in 1916, the singing of ‘patriotic airs’ in a music hall by Jack B. Yeats, and the funeral of Terence MacSwiney in Southwark Cathedral, also by Lavery. 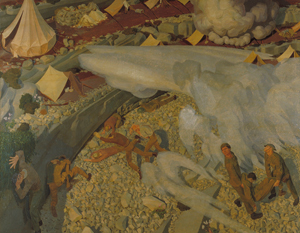 Some of the depictions are low-key, such as Yeats’s ‘Bachelor’s Walk’, referring to the shooting of civilians by British soldiers in the wake of the 1914 Howth gunrunning. There is also a sentimental portrayal of the reaction in Dublin to Queen Victoria’s death. The First World War is not forgotten through the picture of Irish troops caught in a Turkish bombardment. The next gallery has the theme of ‘Conflict’—from the 1601 Battle of Kinsale to the War of Independence. The British navy is also represented, as is the Battle of the Boyne. Perhaps more interesting are two paintings from the 1798 Rebellion, both from the loyalist perspective: The Battle of Ballynahinch and The King’s Drum shall never be beaten for Rebels, in which a regimental drummer defiantly kicks in his drum lest it fall into rebel hands. Seán Keating makes his first appearance with a painting of an IRA column (On the run, front cover). If John Lavery may be regarded as a painter of the old establishment, Keating was the painter of the new order; his paintings have a fresh, modern approach in contrast to the heavy, staid imagery of Lavery. ‘Assembly’ is the pretext for paintings of royal visits, a depiction of an O’Connell monster meeting and a gathering of IRA GHQ staff, united for the last time before the Civil War. Of all the galleries I felt that this was the weakest. Francis Wheatley’s painting of the eighteenth-century Dublin Volunteers stands out among largely mediocre art. The painting of the monster meeting, for example, fails to adequately capture the scale of the event. The section on ‘Allegory’ is perhaps the most interesting in that the paintings emphasise an event’s significance. The Marriage of Strongbow and Aoife by Daniel MacLise is redolent with symbolic imagery lamenting the defeat of the Irish and the onset of centuries of oppression. There is a rare depiction of the Great Famine, showing the despair felt by a family on the failure of the potato crop. 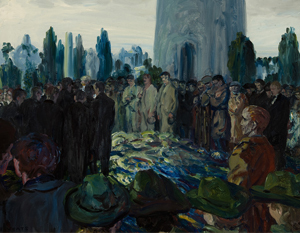 The Blessing of the Colours by John Lavery beautifully encapsulates the Catholic ethos of the newly independent Irish state. 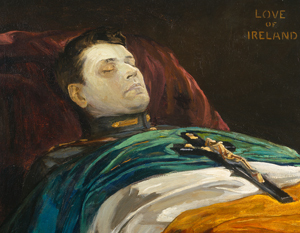 Incidentally, this painting, and that of Michael Collins laid out in state after his death in the following gallery, also shows that even when depicting the new establishment Lavery’s style still reflected the old British establishment. William Orpen’s The Holy Well provides a stark contrast. 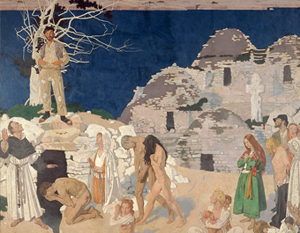 The final gallery portrays ‘Lamentation’, a constant theme in Irish history. As well as the painting of Collins mentioned above, there is the funeral of Harry Boland and a grieving Ireland represented by Dark Rosaleen. 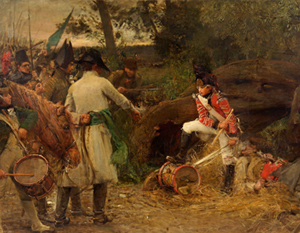 Two paintings worth a closer look are William Henry Bartlett’s Last Brief Voyage and Listed for the Connaught Rangers by Lady Elizabeth Butler. 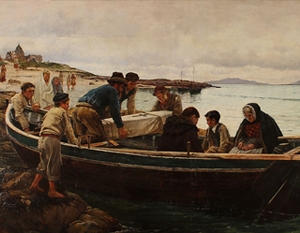 The first depicts the coffin of a child being taken off an island for burial on the mainland. After the artist’s own death, the painting was altered to an emigration scene by painting over the coffin as a trunk. The image of men enlisting in the Connaught Rangers at first appears upbeat but on closer examination reveals a more nuanced message of rural poverty and desperation. There is not enough space here to do justice to all the paintings in this exhibition. In particular, John Lavery, Jack B. Yeats and William Orpen deserve more comment. The works on display reveal a depth to Irish historical art and help us to view Irish history in a different light. I do have some quibbles with the accompanying notes. For example, Brian Boru is widely regarded as the first true high-king of Ireland, not just ‘a claimant’. It is a pity to see repeated the shibboleth that the 1798 Rebellion in Wexford was inspired by sectarianism, and to describe Queen Victoria as a frequent visitor to Ireland is an exaggeration, to say the least. Nevertheless, this does not detract from the exhibition as a whole. 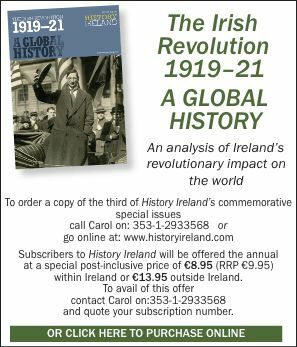 Tony Canavan is editor of Books Ireland.